I received a text from my carrier AT&T about its Mobile Encryption app for my Android Mobile phone. The idea is to create a private VPN tunnel when you are on a public WiFi system. For me that would typically be the free WiFi services offered at airports. Too often with thight travel schedules, it makes the most sense to use my mobile phone to transact business (e.g. read email) instead of firing up my laptop. 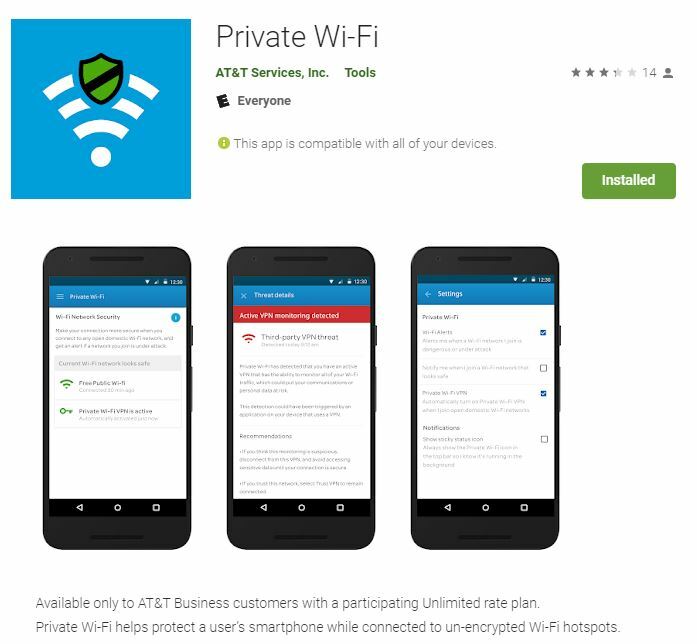 “…Private Wi-Fi is a smartphone application that provides a Virtual Private Network (VPN) and Wi-Fi Alerts to smartphone users who connect to an unencrypted Wi-Fi network. Wi-Fi Alerts notifies you whenever a Wi-Fi network you join appears to be risky or possibly under attack. Wi-Fi Alerts automatically detects when your device connects to a new network and runs a series of health checks on that new network to help ensure that it is behaving properly. If the network is deemed risky, the app will provide you with instructions detailing how to disconnect from the network. Private Wi-Fi Virtual Private Network (VPN) feature automatically connects when you join an open, unencrypted,1 domestic Wi-Fi network. In speaking with Epp, it was interesting to dive deeper. He only uses tethered devices to his mobile phone. He views Bluetooth is insecure and a risk factor for headsets. Interesting! This is only available in the US.